Baking | All about food. Salted caramel and chocolate can’t get any better can it? Combine these two in any desserts and voila… You get these. They are very simple to make too. 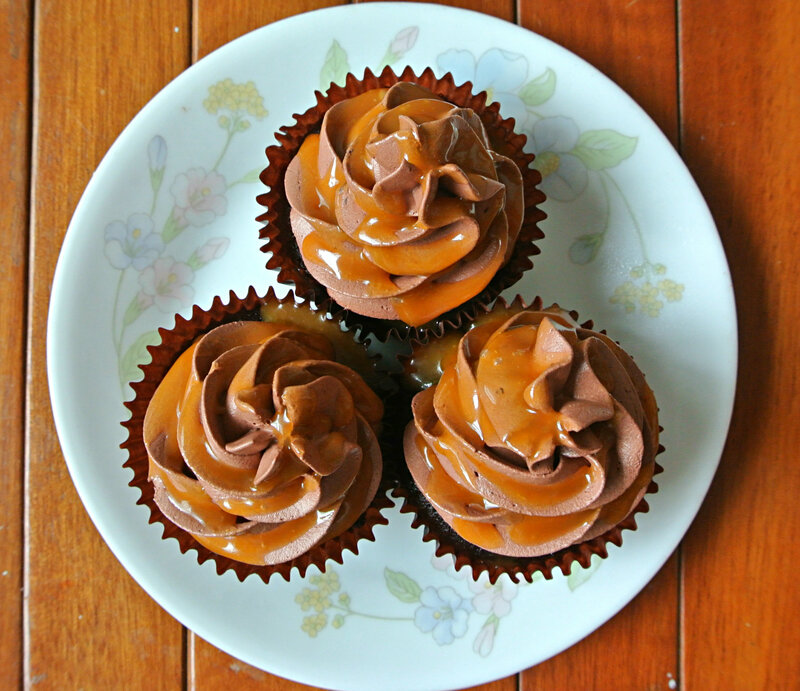 Just get your favourite chocolate cupcake, fill it with home made salted caramel, and top it off with any chocolate frosting that you like eg. chocolate cream cheese, chocolate buttercream, or even the simplest, chocolate whipped cream. Oh, I forgot the important part, salted caramel drizzle. Definitely makes your sweet dessert look extra decadent. 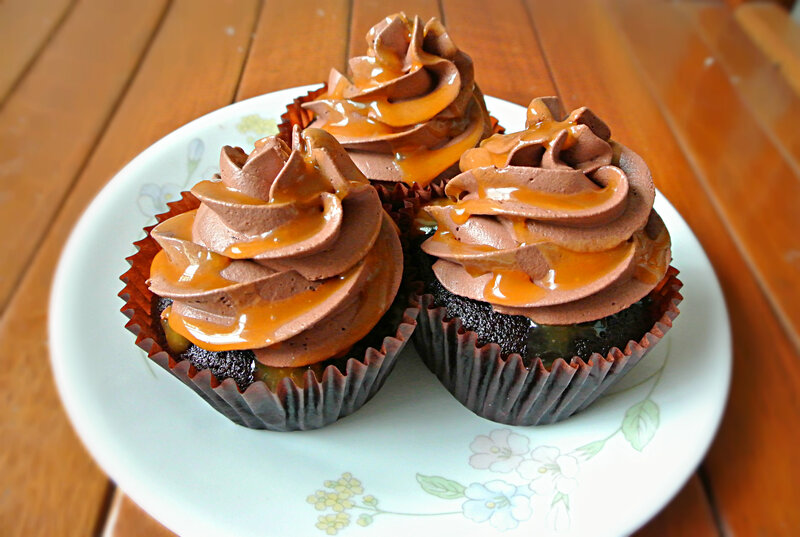 This is my own version of salted caramel chocolate cupcakes recipe. Do try it out and give me feedbacks (: 100% foolproof, except for the caramel part which is a bit tricky. In a large bowl, sift together flour, corn flour, baking soda, baking powder and cocoa powder. Set aside. In another large bowl, mix together sugar, coffee, milk and vegetable oil. Fold in your flour mixture in 3 portions. Mix in egg and vanilla extract. DO NOT OVERMIX. *Because my oven goes haywire at times, I usually do the toothpick test at the 19th minute, and if it is not done, I’ll try again after a minute or so. All items above have to be strictly at room temperature. Heat the sugar in a pot over low fire to dissolve it. Once dissolved, it should turn amber colour, and it should smell toasted. A bit darker is fine as long as it does not smell burnt. Mix in the butter. The melted butter will actually remain on the surface of the caramel but that is fine. Just try your best. After all butter is melted, add in heavy cream. This time you must make sure that you mix them evenly. 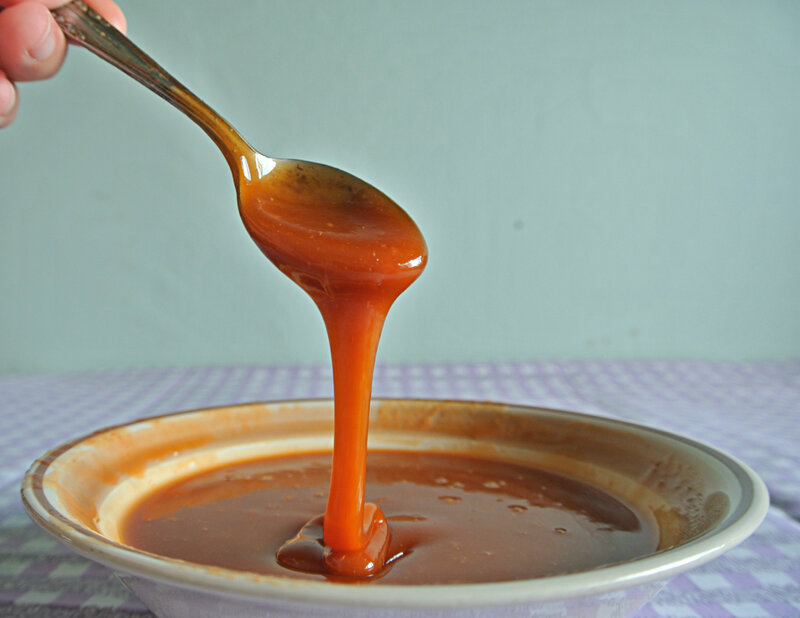 Usually at this point, I’ll continue boiling the caramel for about 2-3 mins so that it can thicken up. However boiling time varies, so.. this is the tricky part. The best is to get a candy thermometer and remove the pot from heat when temperature reaches 350F. After removing pot from heat, sprinkle in 1 tbsp of salt at a time, and taste test it until you are satisfied with the flavour. I added about 4 tbsp of salt. Mix all ingredients in a large bowl and using an electric mixer, whisk on high speed until cream form stiff peaks. Chinese new year is around the corner yayyyy! This year it will fall on the 31 of January 2014, which is less than a month away. 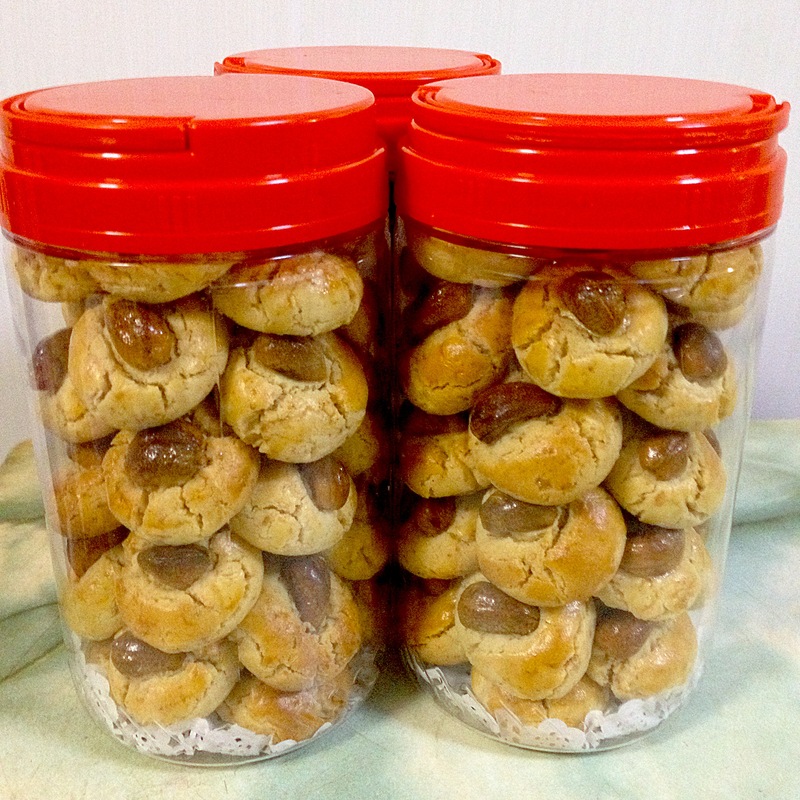 For this year, I have decided to bake CNY goodies and sell them. It’s actually my first time baking them, because everyone says they are very time consuming to make. However, not all goodies are time consuming to make. The famous ones are, such as kueh bangkit (my all time favourite), pineapple tarts (if you are talking about making your own pineapple paste), and the famous kueh lapis. The 2 goodies that I baked were cashew nut cookies and peanut cookies, and they were very good for a first timer like me. Maybe because I cooked the nuts at home instead of buying those pre packaged roasted ones, thus the fragrance is kind of fresh? Enough of all the talking, here is the recipe for the cashew nut cookies that I made. Using a food processor, process 150g of cashew nuts until they become fine crumbs. Mix the fine crumbs with both flours, baking powder and salt. Set the bowl aside. Using an electric mixer, ream butter and sugar until pale yellow and fluffy. Add in egg yolk and vanilla extract, mix well. Incorporate dry mixture in 3 portions. Wrap the dough in plastic wrap and refrigerate for 40 mins. Meanwhile, preheat oven to 180C/350F. Crack an egg and stir well for eggwash. Weigh out 11g for each ball, and using the leftover 70g of cashew nuts, place 1 cashew nut on each ball. After applying egg wash on it with a brush, bake for 15-16 mins or until golden brown on top. *If you bought raw cashew nuts, stir fry it over low fire on a wok for about 1/2 an hour or until it becomes brown in colour. Also, gradually add in oil to the wok every 10-15 mins. 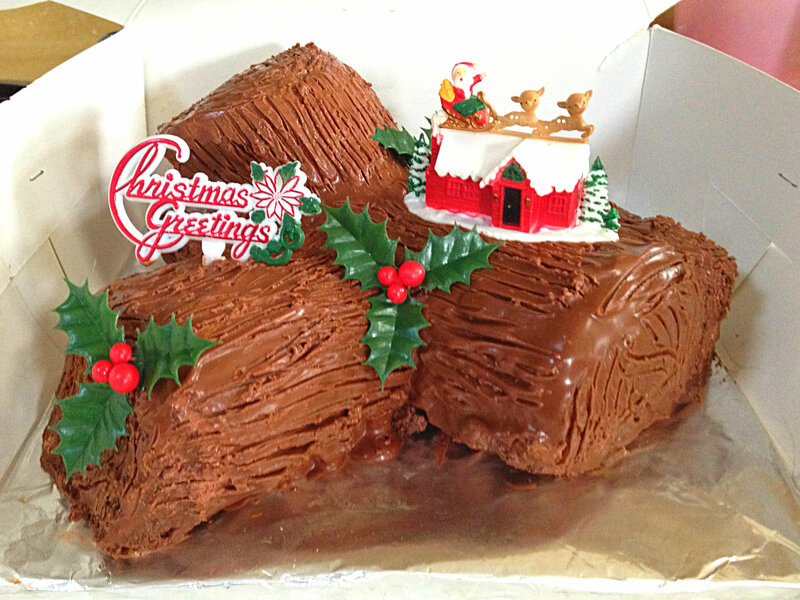 When Christmas was around the corner, I got an order from my friend to make a Christmas log cake for her company’s Christmas feast. So I got this recipe from woodlandbakeryblog.com and made a few changes to it. For more visual information, please go to the website and take a look at the video. It was a tedious 4 part process, and if you are looking for shortcuts, just skip the ganache part :P I got these christmas toppers at Sunlik Trading, which was quite costly, but worth it as I couldn’t find them elsewhere. Overall, it was a good cake. Who could resist a swiss roll? Soft, moist and sweet. The combination of cream and ganache was a great one too, not too sweet, and it has a full blast of chocolate flavour. Definitely worth a try! Using an electric mixer, whisk egg yolks while gradually adding sugar, until ribbon stage*. Set aside. In another clean bowl using clean whisks, whisk egg whites until frothy, then gradually add 2 tbsp of sugar. Continue whisking until egg whites form medium peaks. DO NOT over mix them. Fold in egg whites into egg yolk mixture gently. Be careful not to deflate too much air. A few white streaks left is fine as you still have to mix in your dry ingredients. Sift in cake flour and cocoa powder, mix well. Bake in a 12×18 inch pan for about 12-15 minutes. *Ribbon stage means that when you lift your electric mixer up, the mixture runs back into the bowl like a ribbon. And if you make an ‘8’ pattern on the bowl, it takes about few seconds before the mixture disappears into the bowl. Also, the mixture must be really thick, and very pale yellow in colour. Over low fire, boil sugar + water for about 5 mins, or until temperature of liquid has reached 230F. The colour will be pale yellow like diluted honey. Prepare heavy whipping cream in a clean bowl. Sift in sugar and cocoa powder. Using and electric mixer, beat until it achieves firm peaks. In a saucepan, bring the cream to a boil, and pour over the bowl of chocolate chips. Let it sit for about 5 minutes before stirring it well. When chocolate roulade is cooled, brush a layer of simple syrup over the surface. Then spread a thin layer of whipped cream over. Roll it gently and tightly into a swiss roll. Cut away the sides, and into 3 parts. 1 long, 2 short (slanted on one side). Assemble the shape accordingly, and apply a crumb coat to it. Place it in the freezer for about 1/2 hour. Once ready, pour chocolate ganache over assembled cake until fully covered. Using a fork, create the bark texture.